The return of Summer welcomes a medley of delicious seasonal flavors & celebrations. One of our favorite (and simplest) warm weather recipes highlights our go-to tropical fruits in combination with our High Protein Banana + Almond MacroBar. With only 6 plant-filled ingredients, assembled in less than 25 minutes, this easy breezy recipe is sure to please at your next poolside party or family get-together! 1. Peel the banana’s and place in the freezer for at least 20 minutes to firm & chill. 2. Once chilled, coat each banana in peanut butter (or your preferred nut butter), place on non-stick wax paper & place back in freezer for 5 more minutes. 3. Once the nut butter is slightly firm, remove from the freezer & roll each banana in hemp seeds, or any other superfood. (Chia seeds, flax, bee pollen, or a medley of all)! 4. After the bananas are fully coated in hemps seeds, place back into the freezer. 5. Unwrap and pull apart the two Banana + Almond MacroBars & roll into balls within the palm of your hand, and set aside. Depending on your size preference you can make anywhere from 4 – 8 balls per bar. 6. Peel each kiwi with a paring knife & slice into thin (1/4 inch) slices. You’ll want to ensure that each slice is thick enough to be penetrated by the skewer. 7. 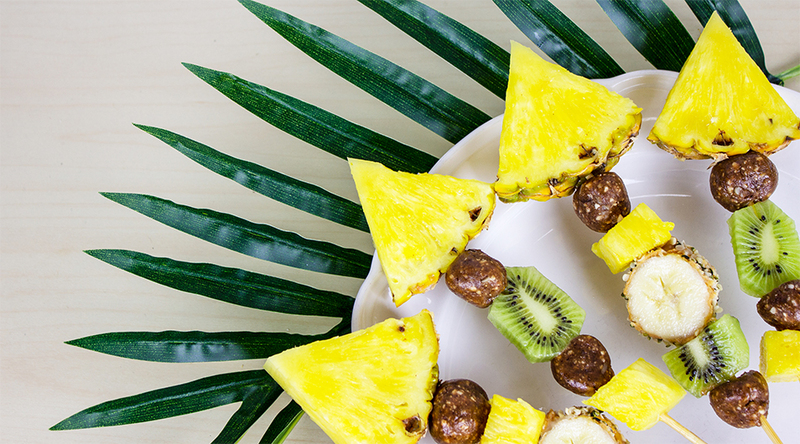 Place your pineapple on its side and slice two 1” rings to be cut into 6 triangles (per ring) & used as the Skewer toppers. The rind should remain on the rings. (as seen in image). 8. 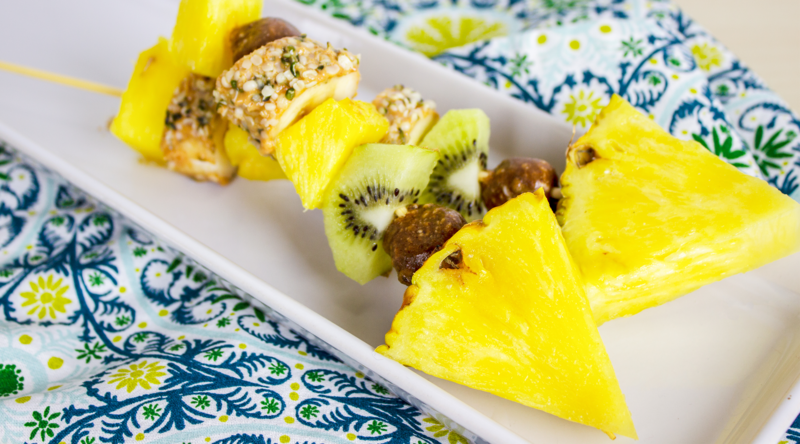 Cut the rind off the remainder of your pineapple & slice into 1-inch cubes to be used throughout your skewers. The remainder of your pineapple can be frozen, or enjoyed fresh as delicious summer treat on its own.